Make a multiple fused glass pendant with a multi-colored stacked art glass center. This art jewelry pendant is kiln formed in a Creative Paradise fusing mold that can produce two pendants 1.75 inches wide. The mold is filled with small pieces of white glass and medium frit, it is then fused in a glass kiln. Once fused and cooled three small pieces are stacked on the pendant and it is then fully fused again in the glass fusing kiln to produce a multiple fused pendant. A second fusing is required as firing the pendant and stacked layers in one go usually results in the stacked pieces melting down and being partially covered by the white base. Spectrum products have been used for this item. Bullseye may also be used. Colors can be varied as desired. 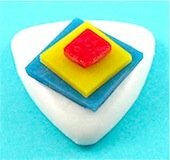 There are a number of ways to cut the small white pieces. They may be cut with a cutter, broken off with grozing pliers or with wheeled mosaic nippers. It is easier to use wheeled nippers as you can nip the pieces in half very quickly if you need to. Safety glasses must be worn when cutting the glass. If you are using mosaic nippers cut along the edges so that you can control the size of the offcuts. Easiest way to do this is to hold the glass and nippers in a plastic bag and let the cut pieces fall into the bag. When finished, just pour bag contents into mold. On a general note wheeled mosaic nippers are a very handy tool to have in your tool kit, glass rods can be nipped to length, pieces easily cut from scrap edges, strips can be quickly cut into pieces, these are just a few of the jobs these nippers will do. Wash and dry the scrap pieces before cutting, as it is very difficult to clean the cut pieces. Try not to hold the scrap piece in the areas that you are cutting. 1 X 1 inch square. 1 X 3/4 inch square. 1 x 3/8 inch square. Step 2. 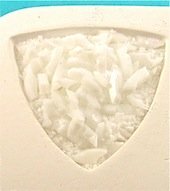 Cut white scrap into pieces. Step 3. Place glass pieces into of dry fusing mold. Be careful so as to not scratch the wash from the mold walls. Step 4. Build pieces up slightly towards the center to help counter shrinkage. This happens because the material tends to compact down into the mold and may end up two thirds of its original thickness. Sprinkle some medium frit around the edges of the glass to fill up any gaps. Do not allow the frit to come up to the edge of the mold otherwise excess spikes may occur. 300 ° F (150° C) hour up to 1360° F (738° C) hold 20 minutes. 500° F (260° C) hour up to 1480° F (804° C) hold 15 minutes. Allow to cool to room temperature and then remove from glass kiln. Step 6. Position the three small colored squares on pendant, a small dab of white glue will hold them in place. Place in kiln and use above firing schedule. Check to ensure that colored pieces are fully fused, turn off fusing kiln and allow glass to cool to room temperature. 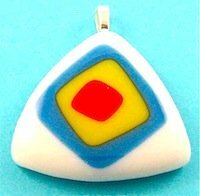 Remove multiple fused art glass pendant from fusing kiln. Roughen up rear of item and fit pendant bail with two part epoxy.